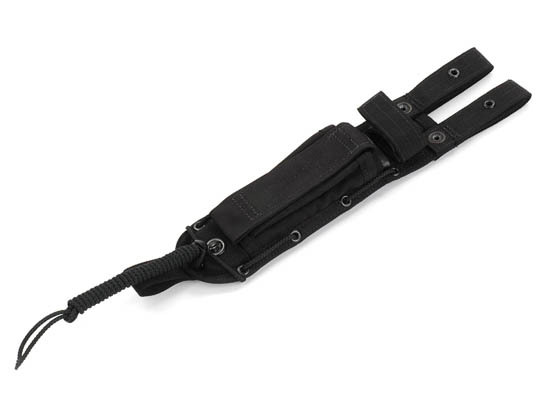 SPEC-OPS 'Combat Master' Short Utility Sheath Black: Fits Blades Up To 6" x 1.75" x 0.25"
The "COMBAT MASTER" utility knife sheath was developed to be the answer to a need from the field: Safely and securely carry the operator's blade as well as be able to easily adapt to all M.O.L.L.E. type (PALS webbing loops) systems as well as duty and pants belts. The COMBAT MASTER is the only sheath commercially available that was specifically designed to accoplish this feat. Fully jumpable and over-built, this is the essential sheath for your combat blade! Tie-down loops on underside. Web loop at bottom for tie-down to packs, leg-loop, etc. Jump-ready with redundent tie-down for sheath handle and additional secure-down points along body and backside of sheath. Micarta-Canvas - Python Piece 12" X 5" X 3/8"
Micarta-Canvas - Black Piece 12" X 5" X 1/4"
Notify me of updates to SPEC-OPS 'Combat Master' Short Utility Sheath Black: Fits Blades Up To 6" x 1.75" x 0.25"